Imagine Holding an Audience in the Palm of Your Hand for One Hour and Getting VERY Well Paid For Doing It. The regular price of this report was $14.97 but for a limited time I am letting you have it for only $7.00. You can Earn an Extra $5000 Monthly with your mind, your message and your mouth. Interested? For the ridiculous price of ONLY $7.00 I will show you what you need to know to take your expertise and experience and share it with an eager public for great money per speech. PLUS... I will throw in a copy of my e book " 35 Ways to Get More Speaking Engagements"
YOU JUST CAN'T BEAT THIS DEAL!!! 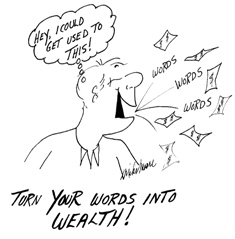 "121 Secrets to Profitable Speaking"
How much to charge and how to ask for for you're worth. How many talks you should have prepared? If you give two speeches a month at $2,500 per speech it comes to $60,000 per year. Some months I deliver 6 or 7. Just who is Mike Moore? Check out my speaking schedule. the average wage earner brings in between $2000 and $3000 per month. You too can earn between $2000 and $3000 for every one hour speech you deliver. Let me show you how!! Earn $2000 or more by simply giving a one hour speech based on your expertise or life experience. You will cherish this little E-book and refer to it often. It contains a tremendous amount of material and will save you a lot of time and effort learning the dos and don'ts of the speaking business. Mike presents what you need to know and do to become a well paid motivational speaker. No fluff or filler, just 121 great profitable speaking tips to help you earn huge fees speaking. You don't have to take my word for it. Here's what satisfied customers have said about my 121 Tips. As soon as I ordered your e-book I was amazed with the service that you provided. You immediately checked to see if I had successfully received your materials and that I was satisfied with them. The value of the tips, information and advice that you provide has far exceeded the cost. Just as you promised, there is no "fluff"- all of it is valuable information and experience from a successful speaker. It is by far the best investment I have made in building my speaking business! Just one piece of advice from your 121 Secrets to Profitable Speaking made me two thousand dollars. An organization wanted me to speak for a stay at a luxury hotel and golf. Mike's said, "No way, find out how many people are going to attend the conference. Then, figure out what a nice meal would cost and multiply each meal by the number of people attending and that is what you charge." Like every one of your tips, it worked. You could read a dozen books on being a successful public speaker and not come away with as much information as you will get from your 121 Secrets to Profitable Speaking. I work full time and still give more than 30 speeches a year all across the Country. Good stuff here! Just 4 of Mike's pay stubs to show what is possible for you as a well paid speaker. It would take years to learn the techniques and strategies involved in becoming a professional speaker. But instead of knocking yourself out learning the ropes of public speaking over a lengthy period of time you can now have everything you need to know and do presented within the pages of one simple ebook "121 Secrets to Profitable Speaking"
What You’ll Discover in "121 Secrets to Profitable Speaking" can literally change your life and your bank account. 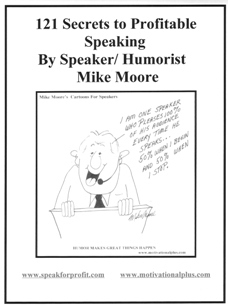 I just finished reading "121 Profitable Speaking Tips" by Mike Moore. What a GREAT resource! He has written a very concise, no nonsense guide to helping you start a profitable speaking career. I learned more from this e-book than the 4 other books I have read on subject of Public Speaking. Great job and keep your e-books coming! "I highly recommend Mike's services and his great ebook to help you get started in the professional speaking business. His help to me cannot be described in words. He's a person who cares about people and he wants to make a difference in the world by helping people. My advice to you, read all about Mike Moore and absorb his advice when it comes to taking the right course in professional speaking." P.S. I just want to repeat that in my "121 Secrets to Profitable Speaking"
you will discover the many techniques and strategies that enable me to consistently earn between $2000 and $3000 for every one hour speech he gives. I can't guarantee that the price for this valuable e-book won't change at any moment so get your copy now. When payment has been cleared you will receive a personal thank you from me with a download link. If you are interested in what I am offering here DON"T PUT ORDERING OFF UNTIL LATER. You'll never get around to it. Take action NOW!!! It could be the best career move you make.
" I believe that we achieve our goals in life more quickly when we help others achieve theirs."